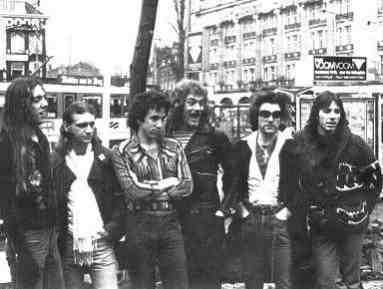 Don't miss Alex's Thin Lizzy and Scottish Roadies. Many of you have probably never heard of the band CLOVER. Die-hard Thin Lizzy fans will know CLOVER as the opening act for Lizzy on some 30 shows back in 1976. 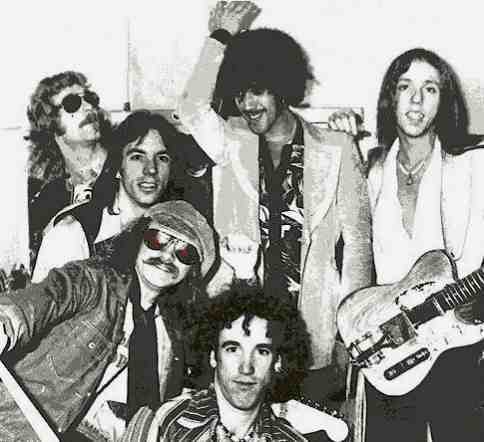 Some background on the roots of the band is included in my "The history of Phil Lynott and Thin Lizzy" pages. Now some of you will know that HUEY LEWIS (later HUEY LEWIS and THE NEWS) was a member of this band. But I doubt that many of you will recognize the name ALEX CALL, although I sure you know at least one of the many songs he's written. The most famous one would be "867-5309/Jenny" made famous by TOMMY TUTONE and co-written with a buddy of his, Jim Keller, who was the lead guitar player in Tommy Tutone. jt: For those who don't recognize your name, please tell us a bit about yourself. Alex: I am a songwriter and former recording artist. I grew up just north of San Francisco and have lived in London, Los Angeles, and currently, Nashville, where I continue to write songs and perform. 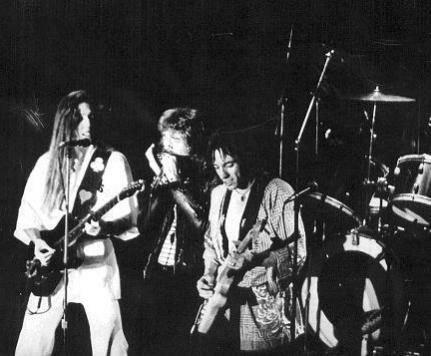 I was the lead singer and principal music writer for San Francisco cult-faves CLOVER, whose other members included HUEY LEWIS, and JOHN McFEE of the DOOBIE BROS.
jt: I must say, over the years you've written or co-written songs for a pretty impressive list of artists. Alex: I wrote (or co-wrote) 867-5309/Jenny, by TOMMY TUTONE, Power of Love and Perfect World for HUEY LEWIS and the NEWS, Little Too Late for PAT BENATAR, New Romeo for SOUTHSIDE JOHNNY, and songs for many other artists, including MR. BIG, CARLENE CARTER, MINDY McREADY, DARYL SINGLETARY and TWIGGY. jt: I believe you also have an ELVIS COSTELLO connection? Alex: CLOVER was the band on Elvis Costello's first album, My Aim Is True. jt: Did CLOVER record any records of their own? Alex: CLOVER recorded four albums for Mercury Records and Fantasy Records. I was also a solo artist for Clive Davis' Arista Records in the early 80's. jt: You have one song that has almost taken on a life of it's own. Tell us about. Alex: 867-5309/Jenny is the one song of mine that has become a cultural icon. It's been passed along to a whole new generation from the one that overwhelmed radio stations with requests for it in the 80's. I estimate conservatively that a hundred million Americans have instant, fond recognition of the song. For many, it is the anthem of the 80's. It is amazingly popular right now. 867-5309 has been used in three national TV ad campaigns, including Cingular Wireless, in the last two years. It has been included in over thirty compilation albums of hit music from the 80's, with sales approaching two million. It's used in several computer games. Brittany Spears had it written on the back of her hands at the Superbowl. It's been used on the Family Guy. It made the national news last year when someone tried to sell the telephone number on Ebay (the bidding got to $80,000 in a few hours, before Verizon blocked it's sale, claiming the owner didn't have the rights to it). People Magazine did a half -page feature on me and the song in their Thirtieth Anniversary Issue last year. I may not be a celebrity, but my song sure is. jt: You mentioned to me that you have written a book. Tell us about it. Alex: This book is about my rock'n'roll life. The story starts with my adolescent introduction to live rock music in 1960 and carries on through my mid-life successes in the 80's. I was a participant in three important eras of rock: the psychedelic 60's in San Francisco, punk London of the mid-70's, and full-throttle L.A. in the 80's. My relationships with Huey Lewis, Elvis Costello, Nick Lowe, Clive Davis, and other well-known and unknown characters help to paint a picture of the realities of the rock world. I tell about the writing of my hits, including 867-5309. Underlying the funny and heartbreaking tales of life as a band member, songwriter, and solo artist, is my personal story of struggle, failure, and ultimate success. It's not a history; it's a rock Ball Four. I see 867-5309 in big, bold numbers on a book jacket, against a background of pertinent graffiti on a bathroom wall. I just know that people will pick up the book to take a look. They will find a page-turner. I have quite a few fun photographs to include. Special thanks to Alex for sharing his time and thoughts with me and for allowing me to share them with you.